Money is what money can buy, and even though money can’t buy you happiness, it can make you comfortable in misery. However, making that money is the tough part because money comes into your wallet through a limited set of ways but if flies out through unlimited doors. Nonetheless, you can list all the ways by which you can make money, and I can bet you won’t run out of ideas. You can make money through a thousand and one means â€“ you can work at the diner down the street, sell, baby diapers, fly an airplane â€“ I am personally fascinated by folks who happen to make their money by trading forex. What is Forex then, you ask. Forex is simply a trade that happens in a global market within cyberspace. However, in Forex, the items of trade are currencies of different countries. Forex trade is based on the fact that the value a currency can rise and fall against other currencies based on global economic headwinds and tailwinds. In essence, trading forex allows you to buy a currency at a lower exchange rate and then sell it (for profit) at a higher exchange rate. Forex-trading forums are filled with sad stories of people that had big dreams on how they would make their first million from forex trades, only to lose all their initial trading capital. In fact, it would appear that the secret to profitable stock trades was reserved for an elite few in the forex trading business. To compound the woes of the traders that are already losing money, some folks are selling forex trading solutions that are not worth the landing pages created to promote them. You’ll find a thousand and one trading systems developed by self-styled trading experts, gurus, and wizards. The systems are supposedly designed to help you set up a trade and go back to sleep while your account balance continue to soar. Some of these trading systems work, but the sad fact is that most of them do not deliver on half of the promises with which they were sold. Can an average Joe make a living from forex trades? 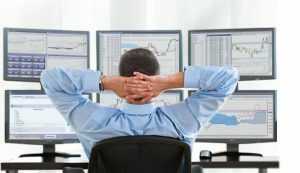 If you are still undeterred and you’ll like to make a living by trading forex, below are some quotes from average Joes who have gone on to make a living by trading forex. The quotes are parts of their answers to the question. A trader by the name Neil Fuller says, “The short answer is yes. The longer answer is yes you can make a living trading the Forex market but you have to consistently do a lot of things rightâ€¦ However, instead of putting pressure on yourself to make a lot of money really fast, focus on building a consistently profitable track record and self confidence and the money will follow.